Orthodontist Geoffrey Kopecky, DDS, and team members at eight SmileCare locations participated in the 24th annual San Diego Regional Law Enforcement Teddy Bear Drive to benefit Rady Children’s Hospital. SmileCare orthodontist Dr. Geoffrey Kopecky (back row, left) and team members from 8 offices donated teddy bears to benefit Rady Children's Hospital. "The SmileCare tradition of caring, providing service to others and giving back to the community gains momentum every year, especially when our teams partner with Rady Children's Hospital." Patients and the entire SmileCare team of hygienists, specialists and general dentists in eight SmileCare offices in San Diego, Chula Vista, El Cajon, and La Mesa came together to donate more than 350 new teddy bears for the 24th annual San Diego Regional Law Enforcement Teddy Bear Drive. The teddy bears are distributed to children undergoing treatment at Rady Children’s Hospital during the holidays and throughout the year. On December 9, a procession of nearly 100 local, state and federal police officers left the U.S.S. Midway Aircraft Carrier Museum in their patrol cars filled with approximately 40,000 teddy bears on a caravan through the streets of San Diego, a spectacle of sirens and flashing lights, en route to Rady Children’s Hospital as an excited crowd of smiling and cheering patients, parents and staff waited to greet the officers as they motored in, one-by-one. San Diego Chargers players Mike Windt, Andrew Gachkar, Darrell Stuckey, Shareece Wright and Nick Novak were on-site handing out bears. When the SmileCare team arrived at Rady Children's Hospital, the head emergency room nurse said she had an immediate need for teddy bears in the emergency room. Without hesitation, the SmileCare team volunteered their bears, which are a symbol of the same compassionate care and patient experience offered on a daily basis by the SmileCare team. 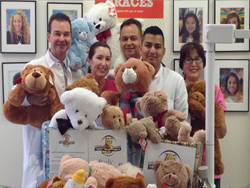 "The SmileCare tradition of caring, providing service to others and giving back to the community gains momentum every year, especially when our teams partner with Rady Children's Hospital," said Dr. Geoffrey Kopecky, who organized SmileCare’s participation in the teddy bear drive. Recognized as “Top Doc San Diego” by Channel 5 Fox News in 2011, Dr. Kopecky offers free orthodontic consultations to patients who would like to know if braces or invisible aligners could help them have the smile they always wanted. SmileCare also offers family dental services, emergency dental services, and specialty dental services. To learn more, call 1-800-32-SMILE or visit SmileCare.com. Coast Dental Services, Inc. is a privately-held practice management company that provides comprehensive, non-clinical business and administrative services to its affiliated practices. The company is headquartered in Tampa, Florida. For more information, visit CoastDental.com. Free Orthodontic Consultation: BRCON. ADA D9310. $126 value. Minimum fee only. Fee may vary with complexity of case. The dentists and hygienists are employees or independent contractors of SmileCare Coast Dental of California, Dental Group of Adam Diasti DDS PC, (Adam Diasti, DDS, Lic. 60596).